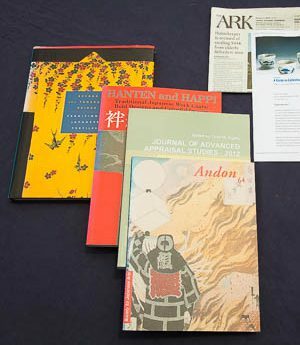 Asian Textiles: An Introductory Guide For Personnal Property Appraisers, Journal of Advanced Appraisal Studies 2012, Foundation for Appraisal Education, Chicago, Illinois. ISBN 978-1-105-57805-2. “Colourful Edo: Fire and Cloth”, Andon 64, 1999, Society For Japanese Arts, Leiden, The Netherlands. Hanten and Happi: Traditional Work Clothing of Japan. Shikosha Publishers, 1998, Japan. ISBN 4-8794-0542-6. Sashiko; a Stichery of Japan, Beyond The Tanabata Bridge, Seattle Art Museum, 1993. Thames and Hudson. ISBN 0-9322-1640-4.